Nobuo Sugiura is a biochemist who, for the past decade, has studied the construction of artificial chondroitin sulfate library using a chemo-enzymatic method and interaction of the synthetic polysaccharides with physiological active molecules. He obtained his B. S. in chemistry at Nagoya University in 1976 and his Ph. D. in pharmaceutical science at the University of Shizuoka in 1995. His doctoral research focused on the syntheses and biological functions of lipid-derivatized glycosaminoglycans. After graduation from Nagoya University, where he worked in at the laboratory of Prof. Sakaru Suzuki, he engaged in studies on bacterial enzymes such as Streptomyces hyaluronidase and bioreactor at Amano Enzyme Inc. and on gut-brain peptides such as cholecystokinin, a sulfated peptide hormone, in the laboratory of Prof. Noboru Yanaihara at the University of Shizuoka. He then studied chemical modification and bioactivities of glycosaminoglycan at the Institute for Molecular Science of Medicine under Prof. Koji Kimata at Aichi Medical University for Seikagaku Corporation in 1988. He has been an associate professor at the institute of Prof. Hideto Watanabe in Aichi Medical University since 2007. The author is currently investigating the biological functions of glycosaminoglycans using the synthetic library and related enzymes. Chondroitin sulfate (CS), a member of the glycosaminoglycan (GAG) family, is a linear polysaccharide ubiquitously distributed in extracellular matrices and on cell surfaces as proteoglycans1. CS proteoglycans in vertebrates are abundant in cartilage, tendon, ligament, artery, and brain. Their fundamental biological roles in development, organ morphogenesis, inflammation, and infection have been investigated. Many animal species, not only vertebrates but also invertebrates such as Nematoda (Caenorhabditis elegans) 2, Echinodermata (sea urchin) 3, Mollusca (squid) 4, and Arthropoda (insect) 5, 6, produce CS proteoglycans. CS chains in proteoglycans are covalently bound to various core proteins through the linkage tetrasaccharide at the serine residue of the core proteins. The chondroitin chain, the backbone of CS, is synthesized onto the linkage by alternating addition of N-acetyl-D-galactosamine (GalNAc) and D-glucuronic acid (GlcA) monosaccharide units to form the polysaccharide. During the polymerization, the chain undergoes sulfate modification at various positions with a variety of sulfotransferases7. The three major disaccharide structures of CS are the non-sulfated unit (0S, GlcA-GalNAc), the mono-sulfated unit at the C-4 position of the GalNAc residue (4S, GlcA-GalNAc4S), and the mono-sulfated unit at the C-6 position of the GalNAc residue (6S, GlcA-GalNac6S) (Fig. 1). Other minor units are multi-sulfated, e.g., diSD (GlcA2S-GalNAc6S), diSE (GlcA-GalNAc4S6S), and triS (GlcA2S-GalNAc4S6S). The biological functions of CS chains are mainly ascribed to the sulfate groups, building structural specificity and diversity into the polysaccharide framework. Fig. 1　Structures of three major CS disaccharides units. 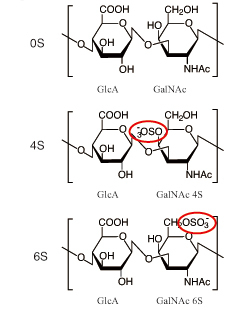 Abbreviations; 0S, 4S, and 6S indicate non-sulfated disaccharide, mono-sulfated disaccharide at position 4 of GalNAc residue, and mono-sulfated disaccharide at position 6 of GalNAc residue. Chondroitinases (chondroitin lyases) that cleave the CS chains are produced by bacteria such as Proteus vulgaris8, Flavabacterium heparinum9, and Arthrobactor aurescens10. These enzymes are widely used for CS analysis because they cleave the glycoside bonds between GalNAc and GlcA residues and generate an unsaturated 4,5-bond on the uronic acid residue at the site of cleavage, enabling detection of the products by UV absorption at 232 nm11. In vertebrates, hydrolytic enzymes like hyaluronidase 1 and 4 have been reported to digest CS and contribute to CS metabolism12. The hydrolysates are saturated oligosaccharides and show no UV absorbability at 232 nm. Recently, we found CS digesting activity in the conditioned medium of baculovirus-infected insect cells in experiments where chondroitin sulfotransferases were expressed in a baculovirus system using Autographa californica nucleopolyhedrovirus (AcMNPV)13. We purified the active molecule from the culture medium and identified it as a truncated molecule of occlusion-derived virus envelope protein 66 (ODV-E66) of AcMNPV. Then we cloned the ODV-E66 homologous gene from the genome of Bombyx mori nucleopolyhedrovirus (BmNPV)14. BmODV-E66 from BmNPV had 92% homology with the amino acid sequence, and 83% chondroitinase activity with the same substrate specificity as AcODV-E66 from AcMNPV. Next we confirmed the presence of CS and further investigated its distribution in the larvae of silkworm, Bombyx mori, the host insect of BmNPV14. Our results suggest that the baculovirus chondroitinase ODV-E66 facilitates viral infection in the host insect, leading to the elucidation of the mechanisms underlying the baculoviral infection. Baculoviruses are rod-shaped, enveloped, and double-stranded DNA viruses (80 ~ 180 kbp genomes) that are pathogens of Lepidoptera including moth and butterfly15. Baculoviruses are distinct among viruses in forming two different virion phenotypes, occlusion-derived virus (ODV) and budded virus (BV) 16. Whereas BV is required for the systemic infection throughout the whole insect body, ODV is required for horizontal infection in the insect population. ODV is enclosed in a highly stable crystalline protein matrix to form an occlusion body called a polyhedron. The primary infection begins in the midgut of an insect when the insect larvae ingest the ODV in polyhedra with feed (plant leaves). Baculoviruses are useful as insecticides (agricultural chemicals) in forest trees and vegetables17. They infect specific insects but not vertebrates including human, have potent pathogenicity to kill hosts, and are stable in the external environment. The expression system using baculovirus is popular and effective for large-scale production of gene products derived from mammalian sources18, and the most commonly used virus is AcMNPV with host insect cell lines such as sf9 and sf21. BmNPV is also used for production of recombinant proteins with silkworm larvae or pupae as the host insect19. We chemo-enzymatically synthesized CS molecules of defined length and sulfate composition, using chondroitin polymerase from E. coli strain K4 (K4CP)20 and various recombinant sulfotransferases from human gene, and generated a CS library with which we investigated the physiological functions of CS species with various antibodies and cytokines that recognize CS chains21. In a series of experiments in which chondroitin sulfotransferases were expressed in the baculovirus (AcMNPV) expression system and sulfation reactions were carried out with the recombinant enzymes, we noticed that some recombinant fractions from the conditioned medium of the baculovirus-infected insect cells generated short CS chains. The conditioned medium of the baculovirus-infected insect cells, even without sulfotransferase cDNA, showed significant chondroitin digesting activity, whereas that obtained from non-infected host cells did not. The fraction containing the activity yielded digestion products composed mainly of di- and tetrasaccharides having UV absorption at 232 nm from the CS substrate. The prepared disaccharides showed the same elution patterns as authentic unsaturated disaccharides prepared with the bacteria chondroitin lyases in a HPLC assay system. The tetrasaccharides represented molecular masses corresponding to unsaturated tetrasaccharides in MALDI-TOF MS analysis. Thus the enzyme expressed by the baculovirus appeared to be a chondroitin lyase. We purified the lyase-active protein in the virus-infected cell culture medium by sequential steps of column chromatography. The purified protein was identified as a truncated molecule started with an N-terminal amino acid residue 67 of ODV-E66 protein [AcODV-E66(67-704)] from AcMNPV with an ESI-MS/MS analyzer and a protein sequencer13. AcODV-E66 consists of 704 amino acids, whose molecular mass of full-length protein is calculated to be 81 kDa, and is an envelope protein coated around the ODV form. We generated expression plasmids for the truncated proteins starting at residues 67 [AcODV-E66(67-704)], 70 [AcODV-E66(70-704)], 100 [AcODV-E66(100-704)], and 24[AcODV-E66(24-704)], and full-length protein [AcODV-E66(1-704)]. The recombinant proteins were expressed with an N-terminal His6-tag in an E. coli expression system, purified by DEAE-Sepharose and Ni-Sepharose column chromatography. The chondroitin lyase activities of the purified recombinant proteins were measured using chondroitin (chemically desulfated CS) as a substrate (Table 1). AcODV-E66(67-704) and AcODV-E66(70-704) showed high chondroitin lyase activity, whereas AcODV-E66(24-704) exhibited significant but lower activity. However, the full-length and AcODV-E66(100-704) showed no enzymatic activity. The chondroitinase AcODV-E66 from baculovirus AcMNPV is a stable enzyme and retains its enzymatic activity over a wide range of pH (pH 4~9) and temperature (30~60°C). The activity of AcODV-E66 is unaffected by divalent metal ions and chelating reagents. These properties are different from those of bacterial chondroitin lyases. We examined the substrate specificity of the recombinant protein AcODV-E66(67-704) using various native GAG. Chondroitin was the best of the examined substrates. All the CS substrates prepared from different animals were digested to a lesser extent (16~30%) than chondroitin. The enzyme minimally digested hyaluronan (0.16%) and did not digest dermatan sulfate, heparin, heparan sulfate, or heparosan13. To further investigate the substrate specificity, we used the chemo-enzymatically synthesized chondroitin (sCH), chondroitin 4-sulfate (sCSA), and chondroitin 6-sulfate (sCSC) polysaccharides, which had an average molecular weight of 10 kDa and consisted of 100% 0S, 92% 4S, and 94% 6S disaccharide units, respectively. The artificial substrates were treated with AcODV-E66(67-704), and the digested products were separated by gel filtration chromatography to di-, tetra-, and longer saccharide fractions, and their disaccharide compositions analyzed (Fig. 2). Most of the sCH and sCSC substrates were degraded to di- and tetra-saccharides (99%), and their disaccharide compositions were similar to the source polysaccharides. In contrast, sCSA was minimally digested, i.e., saccharides longer (93%) than tetrasaccharides remained in the reaction. The disaccharide compositions of di- and tetrasaccharides from sCSA contained large proportions of the 0S units, distinct from the source polysaccharide, whereas those of the long saccharide fraction contained a portion of the 4S units, similar to the sCSA source polysaccharide. ODV-E66 showed narrow substrate specificity with regard to CS structure. It cleaves both 0S and 6S units of CS chains, but does not cleave the other units (4S, diSD, diSE, triS, and other GAG units). Disaccharide compositions of disaccharide (Di), tetrasaccharide (Tetra), and longer saccharide (Long) fractions from the synthesized polysaccharides (sCH, sCSA, and sCSC) digested with AcODV-E66(67-704) and those of the polysaccharides before digestion. Yellow, red, and blue bars indicate 0S, 4S, and 6S disaccharide units. To identify the digestion sites of the baculovirus chondroitinase, we analyzed the structures of non-reducing and reducing sides of tetrasaccharides generated by digestion with the enzyme from several CS polysaccharides. A flow chart of the experiments is shown in Fig. 3A. CS polymer (CSA from whale cartilage, CSC from shark cartilage, or CSAC from bovine trachea) was treated with AcODV-E66(67-704) and the tetrasaccharide fractions [CSA-4 (0S:4S:6S=7:46:47), CSC-4 (5:24:71), and CSAC-4 (7:42:51)] were separated from the reaction mixtures by gel filtration chromatography then labeled with aminopyridine (PA) at the reducing ends. After digestion of the PA-tetrasaccharides with chondroitinase ACII, the free disaccharides of the non-reducing side were analyzed using the post-column HPLC system, and the PA-labeled disaccharides of the reducing side were measured by the fluorescent HPLC system. The disaccharide compositions of the non-reducing side consisted of 0S and 6S units. However those of the reducing side contained a 4S unit that was not digested by ODV-E66 (Fig. 3B). These results demonstrate that ODV-E66 is an endo-type chondroitin lyase which recognizes 0S and 6S disaccharide units and cleaves the non-reducing sides of GlcA residues of the recognition units. A. Methods for determining non-reducing and reducing terminal disaccharides of digested tetrasaccharides. Native CS polysaccharides were digested with ODV-E66. The tetrasaccharide fraction was separated by chromatography and labeled with PA at the reducing ends. 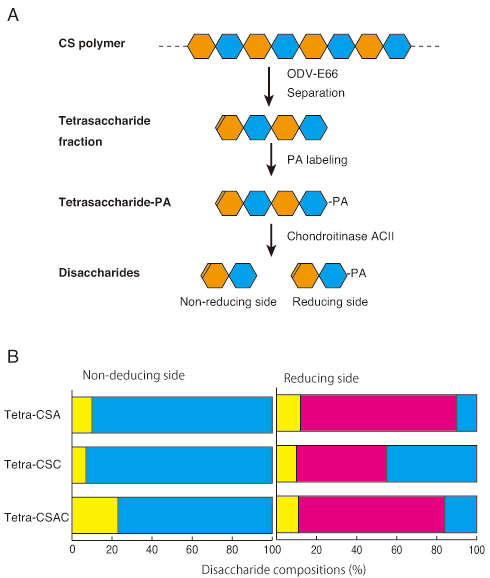 The PA-labeled tetrasaccharides were cleaved with Chondrotitinase ACII to non-reducing terminal free disaccharides and reducing terminal PA-labeled disaccharides. B. Disaccharide compositions of non-reducing and reducing sides of the PA-labeled tetrasaccharide fractions (tetra-CSA, tetra-CSC, and tetra-CSAC) from native CSA, CSC, and CSAC digested with ODV-E66. 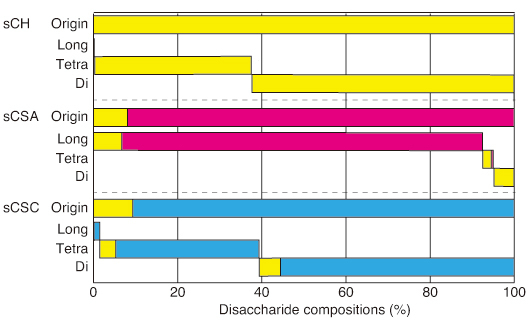 Yellow, red, and blue bars indicate 0S, 4S, and 6S disaccharide units. Recently, the three-dimensional structure of AcODV-E66 was determined by X-ray crystal structure assay method22. 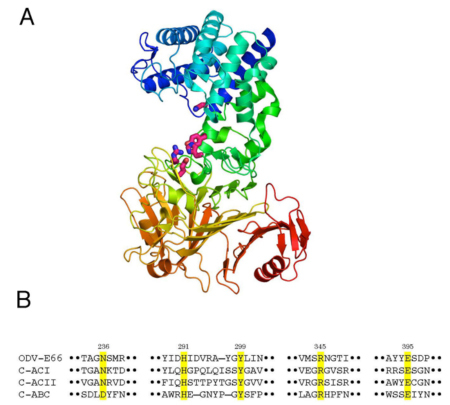 The overall structure of AcODV-E66 confirmed the protein to be composed of two domains, α-helix rich domain in the N-terminal region and β-strand rich domain in the C-terminal region (Fig. 4A). The structural features were very similar to those of the well-characterized polysaccharide lyase 8 (PL8) family23, which includes bacterial chondroitinase ACI, ACII, and ABC, although the amino acid sequence identities were under 12% between ODV-E66 and the bacterial chondrotinases. 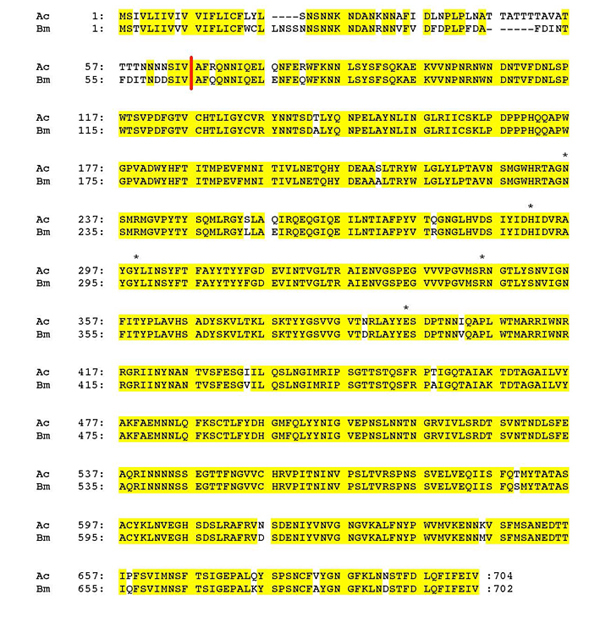 According to the alignment of the amino acid sequences, based on the structural information, ODV-E66 possessed five residues (Asn236, His291, Tyr299, Arg345, and Glu395) corresponding to the catalytic region of PL8 family enzymes (Fig. 4B), which have been shown to be essential for enzymatic activity by mutational analyses22. A. Crystal structure of AcODV-E66 indicating the five amino acid residues essential for enzyme activity in the catalytic region. B. Selected sequence alignments of AcODV-E66 and bacterial chondroitinases (C-ACI, C-ACII, and C-ABC). The five amino acid residues in the catalytic region are highlighted in yellow. The gene encoding ODV-E66 protein exists ubiquitously in most baculovirus species. BmNPV, which infects silkworm (Bombyx mori) and kills the insect, has an ODV-E66 homologous gene. The full length ODV-E66 protein from BmNPV (BmODV-E66) consists of 702 amino acids and has a sequence similar (92%) to that of AcODV-E66. We cloned the BmODV-E66 gene from the BmNPV genome, generated an E. coli-expression plasmid, and expressed an N-terminally truncated protein BmODV-E66(65-702) at the position aligned with AcODV-E66(67-704) (Fig. 5). Fig. 5　Alignments of amino acid sequence of AcODV-E66 (Ac) and BmODV-E66 (Bm). Star marks indicate the five amino acid residues essential for enzyme activity. Red line indicates the N-terminal site of both truncated recombinant proteins. The expressed BmODV-E66 protein shows chondroitin lyase activity as well as AcODV-E66. The enzyme properties, such as active pH range, temperature range, and substrate specificity, are the same as those of AcODV-E66. Both enzymes cleave the 0S and 6S units of CS at the non-reducing ends of the GlcA residues, but not 4S and other multi-sulfated disaccharide units14. It is conceivable that ODV-E66 plays an important role as a chondroitinase when the baculovirus infects an insect. The presence of CS digesting activity in baculoviruses strongly suggests that the host insect possesses the CS substrate. The host insect may have CS to defend against the invasion of foreign substances, and chondroitinase produced by the baculovirus may digest the insect CS to facilitate infection. To investigate the presence of CS, we used larvae of the silkworm (Fig. 6) as a typical host insect because of its availability and infectivity by BmNPV14. GAG fractions from several tissues of fifth-instar larvae of the silkworm were extracted and purified. The amounts and disaccharide compositions of CS in the GAG fractions from silkworm tissues were determined (Table 2). CS was present in insect tissues such as the midgut, peritrophic membrane (PM), silk gland, and skin. PM is an acellular membrane that lines the midgut lumen and separates ingested vegetation from the midgut epithelium24. The CS amount per tissue weight was largest in the silk gland, followed by the PM, then the midgut and the skin. The sulfation degree of CS was 38~54% in the midgut, PM, and silk gland, in contrast with the high degree in skin (80%). 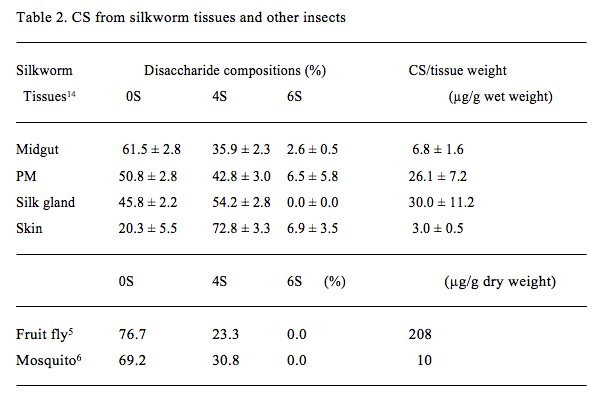 The sulfated disaccharide unit of CS in the silkworm was mainly the 4S unit, although significant 6S unit was observed in the midgut, PM, and skin. No di-sulfated or tri-sulfated disaccharides were detected. Previous studies have found the presence of minimally sulfated CS, mainly containing the 0S unit, followed by the 4S unit, in other insects such as fruit fly5 and mosquito6 (Table 2). A previous report showed the presence of a significant number of 6S units in the CS in Drosophila embryos at stage L325. We have clearly shown the presence of the 6S unit in the CS in silkworm tissues, using sulfate-position-specific chondroitin sulfatases. Interestingly, the disaccharide compositions of CS differed between tissues of the silkworm. These findings suggest different expression levels of chondroitin 4-O-sulfotransferease(s) and 6-O-sulfotransferase(s) in tissues that synthesize CS in vivo. The CS containing 0S and 6S units in the midgut and PM correlates well with the substrate specificity of ODV-E66 chondroitinase, which preferentially contains 0S and 6S units. Next, we investigated the distributions of CS in larvae of silkworm with immunostaining14. The whole body longitudinal section of the fifth-instar larva of silkworm was stained with anti-CS antibody 473 that preferentially recognizes non-sulfated chondroitin26 (Fig. 7). Antibody 473 stained many tissues, including midgut, silk gland, and skin tissues of silkworm larvae. In the midgut, the antibody strongly immunostained the PM, microvilli of the columnar epithelium, and basement membrane (Fig. 8A). H-E stained epithelial cells strongly, and PM weakly (Fig. 8B). PM appeared as an extracellular matrix consisting of several thin (0.2~1 µm) layers between ingested vegetation and midgut epithelium. In the silk gland, the antibody immunostained the basement membranes inside and outside the cell layer (Fig. 8C). In the integument, the antibody strongly immunostained the epicuticle region outside the cuticle layer, a line between cuticle and epidermis, basement membrane inside the epidermis, and basement membrane adjacent to the fat bodies (Fig. 8E). Immunohistochemical analysis using various anti-CS antibodies illustrates the tissue distributions of various CS structures14. Fig. 7　Longitudinal sections of silkworm larva whole body. The sections were stained with antibody 473 (A) and H-E (B). 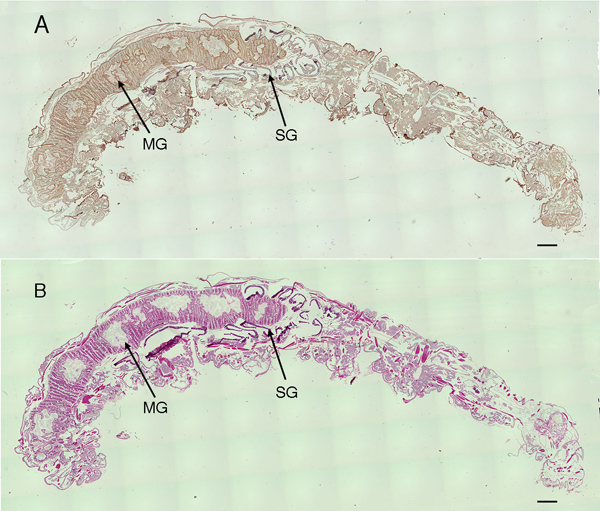 MG and SG indicate midgut and silk gland. The bar indicates 500 µm. Fig. 8　Histochemical analyses of midgut (A and B), silk gland (C and D), and skin (E and F) of silkworm larvae. Cross sections of the silkworm tissues were stained with antibody 473 (A, C, and E) and H-E (B, D, and F). PM, EC, BM, SC, CL, EP, and FB indicate peritrophic membrane, epithelial cells, basement membrane, silk gland cell layer, cuticle layer, epidermis, and fat body, respectively. The bar indicates 20 µm. Polyhedra of baculoviruses forming ODV are ingested with plants by insect larva, move to the midgut, and are dissolved there by high pH and digestion enzymes. The released virus rods infect midgut epithelial cells (primary infection) through the PM that separates ingested vegetation from the midgut epithelium. BV is then produced in the epithelial cells, spreading the infection throughout the insect body (secondary infection). ODV is next produced in the nuclei of the insect cells and released as polyhedra to the external environment upon disintegration of the insect (late infection). However, the detailed mechanisms underlying the baculoviral infection remain unclear. The PM is an extracellular matrix that lines the midgut lumen in the form of several layers of tubes, extending from the anterior midgut to the hindgut, and composed of chitin, glycoproteins, and CS proteoglycans, which maintain its hydrophilicity and elasticity. The PM protects the midgut epithelium from mechanical and toxic damage caused by ingested materials and acts as a barrier against infection by pathogens. The primary infection by baculovirus begins in the midgut. Recently, Xiang et al. 27 reported that an ODV-E66 deletion mutant of AcMNPV required a 103-fold higher titer than control viruses in a 50% lethal dose assay in which viruses were orally ingested by host insect larvae. In contrast, BV of the deletion mutant infected Sf9 insect cells as efficiently as the control virus. This finding indicates that the ODV-E66 envelope protein plays an important role in the oral infectivity of the baculovirus, although it is not essential for viral replication. Another report indicated that a peptide derived from similar sequences of AcODV-E66 binds the midgut epithelium of lepidopteran and competes with the baculovirus infection28. We have demonstrated that CS from the silkworm PM is actually digested with BmODV-E66 chondroitinase14. 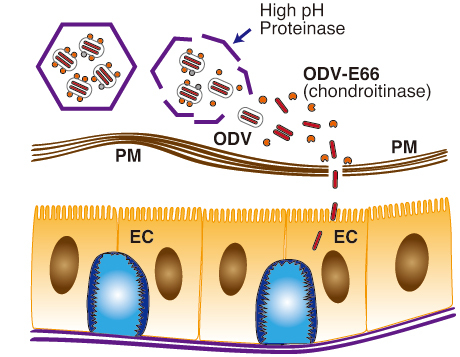 Several lines of evidence suggest that in the primary infection ODV-E66 proteins are released from the ODV envelope in the alkaline environment in the midgut of the host insect as dissolution of the occlusion bodies, and activated with midgut proteases cleaving N-terminal peptides of ODV-E66. The activated virus chondroitinases will digest CS in the PM and facilitate invasion of the ODV into the epithelial cells through the destroyed PM (Fig. 9). Fig. 9　Hypothetical model of the primary infection of baculovirus. Polyhedra of baculoviruses orally ingested by insect larvae are dissolved in the midgut of insect by high pH and digestion enzymes. Simultaneously, ODV-E66 envelope protein is released and truncated to induce chondroitinase activity. The activated ODV-E66 digests CS in the PM to facilitate baculovirus infection in the midgut epithelial cells. The present article describes the discovery of a novel chondroitinase from baculovirus, the distribution of CS in silkworm tissues, and offers a hypothesis regarding baculovirus infection mechanisms in host insect by virus chondroitinases. The information contained herein helps elucidate the mechanisms underlying baculovirus infection of insects in vivo, and provides a better understanding of the physiological functions of CS in insects as well as vertebrates. The author is grateful to Dr. Yoshimitsu Kakuta of Kyushu University for providing the image of the crystal structure. This work was supported by Grants-in-Aid for Scientific Research (# 23570176) and Supported Program for the Strategic Research Foundation at Private Universities (s1101027) from the Ministry of Education, Culture, Sports, Science and Technology, Japan. 1. Esko J.D., Kimata K., and Lindahl U.: Proteoglycans and Sulfated Glycosaminoglycans. In: Essentials of Glycobiology. 2nd ed. (Varki A, Cummings RD, Esko J.D., Freeze H.H., Stanley P., Bertozzi C.R., Hart G.W., Etzler M.E., ed. ), NY, Cold Spring Harbor. 229-248, 2009. 2. Mizuguchi S, Uyama T, Kitagawa H, Nomura KH, Dejima K, Gengyo-Ando K, Mitani S, Sugahara K., and Nomura K.: Chondroitin proteoglycans are involved in cell division of Caenorhabditis elegans. Nature, 423 (6938), 443-448, 2003. 3. Yamaguchi M., Kinoshita S., and Suzuki N.: Dermatan sulfate formation in gastrulae of the sea urchin Clypeaster japonicus. J. Biochem., 106 (1), 158-162, 1989. 4. Habuchi O., Sugiura K., Kawai N., and Suzuki S.: Glucose branches in chondroitin sulfates from squid cartilage. J. Biol. Chem., 252 (13), 4570-4576, 1977. 5. Toyoda H., Kinoshita-Toyoda A., and Selleck S.B. : Structural analysis of glycosaminoglycans in Drosophila and Caenorhabditis elegans and demonstration that tout-velu, a Drosophila gene related to EXT tumor suppressors, affects heparan sulfate in vivo. J. Biol. Chem., 275 (4), 2269-2275, 2000. 6. Dinglasan R.R., Alaganan A., Ghosh A.K., Saito A., van Kuppevelt T.H., and Jacobs-Lorena M.: Plasmodium falciparum ookinetes require mosquito midgut chondroitin sulfate proteoglycans for cell invasion. Proc. Natl. Acad. Sci. U S A, 104 (40), 15882-15887, 2007. 7. Habuchi O.: Diversity and functions of glycosaminoglycan sulfotransferases. Biochim Biophys. Acta., 1474 (2), 115-127, 2000. 8. Yamagata T., Saito H., Habuchi O., and Suzuki S.: Purification and properties of bacterial chondroitinases and chondrosulfatases. J. Biol. Chem., 243 (7), 1523-1535, 1968. 9. Michelacci Y.M., and Dietrich C.P. : A comparative study between a chondroitinase B and a chondroitinase AC from Flavobacterium heparinum: Isolation of a chondroitinase AC-susceptible dodecasaccharide from chondroitin sulphate B. Biochem. J., 151 (1), 121-129, 1975. 10. Hiyama K., and Okada S.: Crystallization and some properties of chondroitinase from Arthrobacter aurescens. J. Biol. Chem., 250 (5), 1824-1828, 1975. 11. Suzuki S., Saito H., Yamagata T., Anno K., Seno N., Kawai Y., and Furuhashi T.: Formation of three types of disulfated disaccharides from chondroitin sulfates by chondroitinase digestion. J. Biol. Chem., 243 (7), 1543-1550, 1968. 12. Kaneiwa T., Mizumoto S., Sugahara K., and Yamada S.: Identification of human hyaluronidase-4 as a novel chondroitin sulfate hydrolase that preferentially cleaves the galactosaminidic linkage in the trisulfated tetrasaccharide sequence. Glycobiology, 20 (3), 300-309, 2010. 13. Sugiura N., Setoyama Y., Chiba M., Kimata K., and Watanabe H.: Baculovirus envelope protein ODV-E66 is a novel chondroitinase with distinct substrate specificity. J. Biol. Chem., 286 (33), 29026-29034, 2011. 14. Sugiura N., Ikeda M., Shioiri T., Yoshimura M., Kobayashi M., and Watanabe H.: Chondroitinase from baculovirus Bombyx mori nucleopolyhedrovirus and chondroitin sulfate from silkworm Bombyx mori. Glycobiology, 23 (12), 1520-1530, 2013. 15. Adams J.R., and McClintock J.T. : Baculoviridae, Nuclear polyhedrosis viruses, Part 1. Nuclear polyhedrosis viruses of insects. In: Atlas of Invertebrate Viruses (Adams, J. R. and Bonami J. R., eds. ), Boca Raton, CRC Press, 89-204, 1991. 16. Rohrmann G.F.: Baculovirus Molecular Biology, 2nd Ed. Bethesda, Bookshelf NCBI, 2011. 17. Szewczyk B., Hoyos-Carvajal L., Paluszek M., Skrzecz I., and Lobo de Souza M.: Baculoviruses– re-emerging biopesticides. Biotechnol. Adv., 24 (2), 143-160, 2006. 18. Luckow V.A. : Baculovirus systems for the expression of human gene products. Curr Opin. Biotechnol., 4 (5), 564-572, 1993. 19. Motohashi T., Shimojima T., Fukagawa T., Maenaka K., and Park E.Y. : Efficient large-scale protein production of larvae and pupae of silkworm by Bombyx mori nuclear polyhedrosis virus bacmid system. Biochem. Biophys. Res. Commun., 326 (3), 564-569, 2005. 20. Ninomiya T., Sugiura N., Tawada A., Sugimoto K., Watanabe H., and Kimata K.: Molecular cloning and characterization of chondroitin polymerase from Escherichia coli strain K4. J. Biol. Chem., 277 (24), 21567-21575, 2002. 21. Sugiura N., Shioiri T., Chiba M., Sato T., Narimatsu H., Kimata K., and Watanabe H.: Construction of a chondroitin sulfate library with defined structures and analysis of molecular interactions. J. Biol. Chem., 287 (52), 43390-43400, 2012. 22. Kawaguchi Y., Sugiura N., Kimata K., Kimura M., and Kakuta Y.: The crystal structure of novel chondroitin lyase ODV-E66, a baculovirus envelope protein. FEBS Lett., 587 (24), 3943-3948, 2013. 23. Lombard V., Bernard T., Rancurel C., Brumer H., Coutinho P.M., and Henrissat B.: A hierarchical classification of polysaccharide lyases for glycogenomics. Biochem. J., 432 (3), 437-444, 2010. 24. Wang P., and Granados R.R. : Molecular structure of the peritrophic membrane (PM): identification of potential PM target sites for insect control. Arch. Insect. Biochem., Physiol. 47 (2), 110-118, 2001. 25. Pinto D.O., Ferreira P.L., Andrade L.R., Petrs-Silva H., Linden R., Abdelhay E., Araujo H.M., Alonso C.E., and Pavao M.S. : Biosynthesis and metabolism of sulfated glycosaminoglycans during Drosophila melanogaster development. Glycobiology, 14 (6), 529-536, 2004. 26. 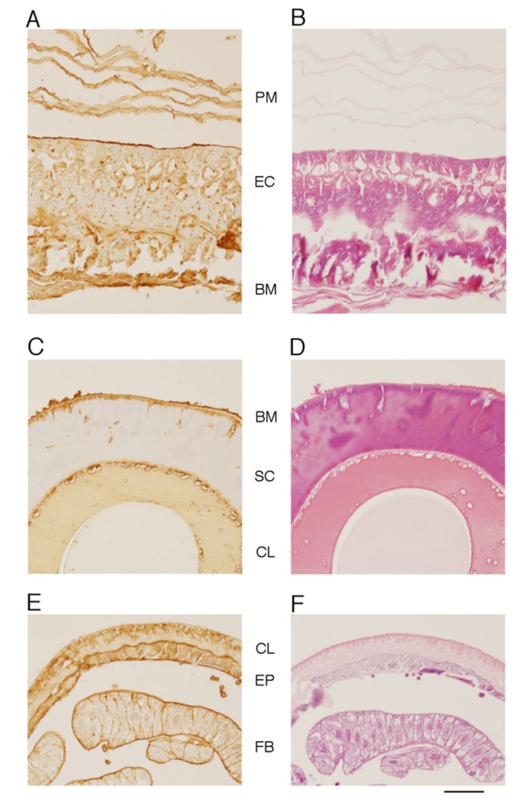 Oohira A., Matsui F., Watanabe E., Kushima Y., and Maeda N.: Developmentally regulated expression of a brain specific species of chondroitin sulfate proteoglycan, neurocan, identified with a monoclonal antibody IG2 in the rat cerebrum. Neuroscience, 60 (1), 145-157, 1994. 27. Xiang X., Chen L., Hu X., Yu S., Yang R., and Wu X.: Autographa californica multiple nucleopolyhedrovirus odv-e66 is an essential gene required for oral infectivity. Virus Res. 158 (1-2), 72-78, 2011. 28. Sparks W.O., Rohlfing A., and Bonning B.C. : A peptide with similarity to baculovirus ODV-E66 binds the gut epithelium of Heliothis virescens and impedes infection with Autographa californica multiple nucleopolyhedrovirus. J. Gen. Virol. 92 (Pt 5), 1051-1060, 2011.